Individual control of your engines, thrusters and windlass from the palm of your hand. It is intuitive and naturally easy to berth your yacht with the DUAL BAND from Yacht Controller. As with all the wireless remotes align the boat image on the remote with your yachts bow and all functions come naturally to your fingertips. The DUAL BAND is the first remote in the Yacht Controller family to operate with dual frequency transmissions which protect from extraneous RF transmissions or disturbances. Designed with custom Silicone diaphragm switch levers which give you precise control of each engine or thruster with a return to neutral or off when your remove pressure from them. Wireless remotes are available in two colours Grey or Blue. A Modular design, easily modifiable in case you want to add new features or transfer to a new yacht. Available, as with all the Yacht Controller systems, to be compatible with a wide range of electronic helm control levers. 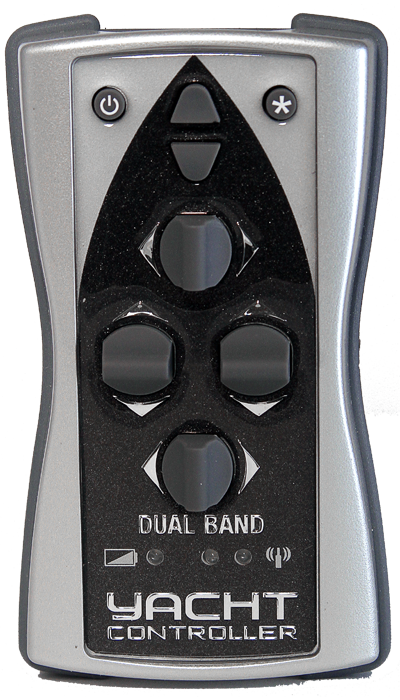 A natural evolution of the standard DUAL BAND the DUAL BAND PLUS adds features to further enhance the performance of the remote. This wireless remote from Yacht Controller is ideal for larger yachts or displacement vessels with engine controls with acceleration control or for those owners looking for the maximum control from their wireless remote. 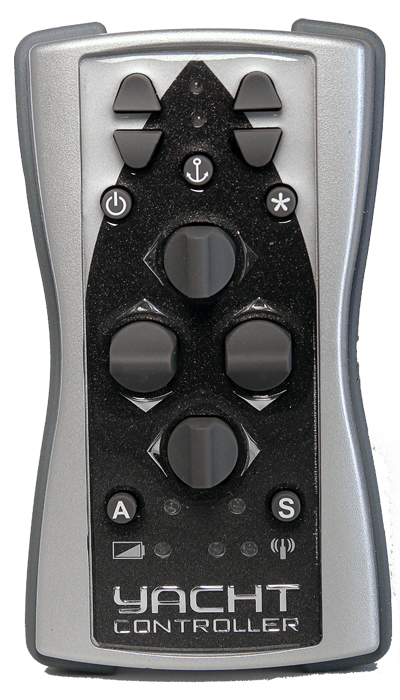 For electronic control heads that offer acceleration option* the remote has 5 profiles selectable that increase the engine rpm over a set period. These are selected by using the ’S’ button and can assist manouvering giving more power during adverse conditions of wind and tide. The Manual/Automatic mode is selected or toggled on or off using the ‘A’ button. While the remote is in the Manual mode all the engine and thruster levers work independently to operate as requested. The Automatic mode is a useful feature which when selected provides a combination of engines and thrusters to move your yacht easily ahead or astern while including a port or starboard movement. This mode is operational and effective for yachts with only a bow thruster or bow and stern thruster. 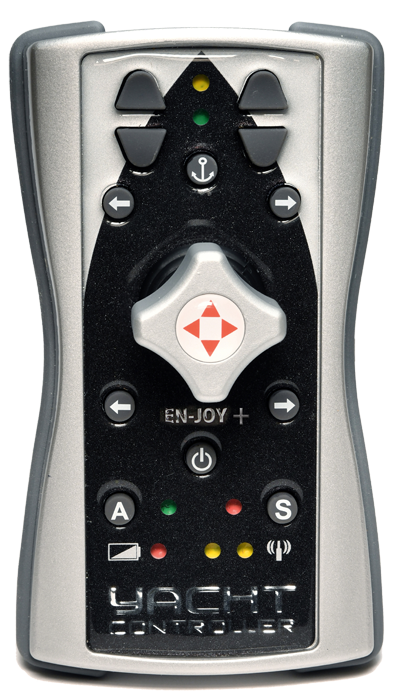 For the Joystick lovers the EN-JOY PLUS is the best of the Yacht Controller wireless technologies applied on a joystick! A NEW and unique product for 2018. As with the DUAL BAND PLUS, V.IPS and the EN-JOY the EN-JOY PLUS is configurable with 1 or 2 anchor winches, Bow and Stern thrusters, Acceleration profiles and Automatic/Manual mode. Rotate the yacht by rotating the Joystick. Control of your yacht from the perfect location at any time; all in the palm of your hand. The owner has the choice with patented and approved wireless control from Yacht Controller. V.IPS for IPS Pod Drives is one of the latest advances in yachting innovation manoeuvring technology from Yacht Controller. Fully compatible with Volvo Penta IPS stern pod drives. Designed with Automatic and Manual control modes it can integrate any bow or stern thrusters installed. In Manual Mode the V.IPS reproduces the commands of the fixed IPS Joystick onboard. Selecting Automatic mode will also enable any installed bow or stern thrusters to operate via the joystick and assist the manoeuvring of the yacht. Thrusters and anchor windlass(s) on the yacht can be controlled independently from the V.IPS Joystick. Yachts with the IPS joystick having High Mode and Dynamic Positioning Mode enabled can operate these functions from the V.IPS. Integrates with all models of IPS joysticks. 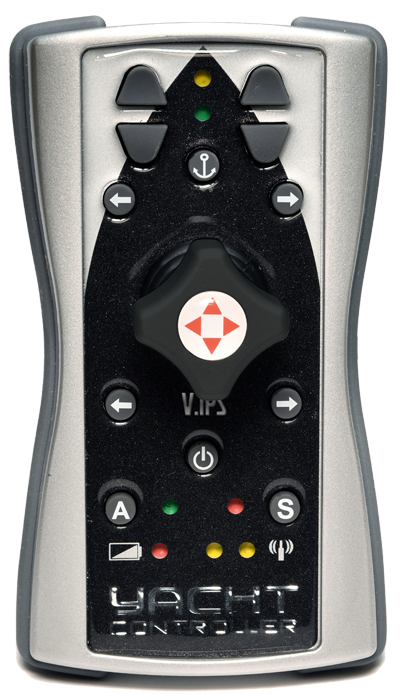 For yacht owners with IPS without joystick Yacht Controller offer the EN-JOY PLUS remote. V.IPS features wireless charging and Dual Frequency Band Transmission giving peace of mind against unregulated RF disturbances. JCS PLUS, the Joystick for a fixed location at helm station(s) or additional Joysticks around your yacht. With a simple movement of the hand, the Joystick allows simultaneous operation of the motors and of the bow and stern thrusters, enabling you to moor and move the boat in any direction simply and precisely. Without risk and danger and with total ease. The JCS PLUS is an ergonomic joystick with LCD panel to indicate engines and thrusters active during a manoeuvre. The panel configures the operating modes including Automatic/Manual mode and Acceleration mode (if applicable*). In automatic mode, the engines and thrusters are used simultaneously to aid and facilitate mooring manoeuvres for those with less experience. In manual mode, the thrusters can be activated as required, both together with the engines or separately, for control of the manoeuvre you wish to perform. The JCS PLUS can be used alone or add a DUAL BAND or EN-JOY wireless remote so you can transfer control from the JCS PLUS or your chosen wireless remote. As with all Yacht Controller systems, integration is achieved at the helm station(s) without invasive engine room wiring. 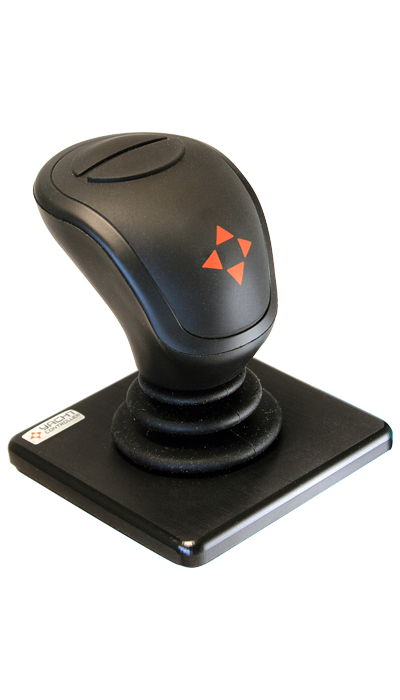 The JCS PLUS joystick is all this: another valid and essential aid for managing your yacht. Mediante cualquiera de los sistemas Yacht Controller podrá maniobrar tanto los motores, como las hélices de proa y popa e incluso el molinete de ancla de su embarcación. Desde 1999, año en el que lanzamos al mercado el primer sistema de control remoto para la maniobra de embarcaciones, no hemos cesado de innovar. Yacht Controller nace a finales de los noventa de una larga experiencia en el sector de los procesos de automatización de la industría combinada a dos pasiones: la navegación y la tecnología.Desde sus inicios la firma destaca rápidamente por la innovación de sus soluciones y la calidad de su fabricación. El sistema Yacht Controller se conecta a los mandos electrónicos de cualquier barco independientemente de si la transmisión es por eje, de cola o IPS. ¿Qué mandos electrónicos lleva instalado mi barco? Contacte a su profesional de confianza y pídale presupuesto o localize a nuestro partner vendedor-instalador más cercano. Y si tiene cualquier pregunta no dude en llamarnos. !Únete ya a nuestra red!